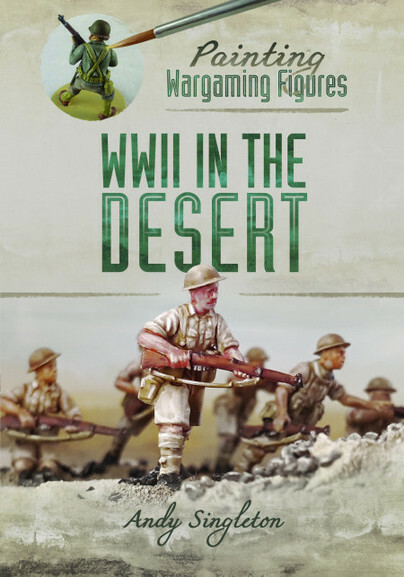 You'll be £11.99 closer to your next £10.00 credit when you purchase Painting Wargaming Figures: WWII in the Desert. What's this? Andy Singleton has been modelling and painting most of his life and has been a professional commission figure painter for some years now. Here he shares his experience and tips of the trade with those collecting figures for the North African campaigns in WWII. The four main sections of the book cover British, Italian, German and US troops, as well as tips on assembly and painting camouflage uniforms. Each section is divided into three levels of complexity, ‘conscript’, ‘regular’ and ‘elite’, allowing the reader to build up an array of techniques as they gain confidence and experience. The emphasis is on achievable results and practical advice that is applicable to painting units or whole armies for wargaming purposes in a reasonable time frame, not on spectacular individual display pieces. Most of the figures featured in the numerous illustrations are sized either 28mm or 20mm but the techniques described are easily adaptable to smaller sizes and both plastic and metal figures are covered. Andy’s clear, step-by-step guidance takes the reader through the process from the initial preparation and assembly of the figure, to finishing and basing. Andy Singleton has been modelling and painting since childhood, having built subjects across a broad range of subjects, scales and genres. In 2014, Andy decided to stop having a proper job and picked up his brushes full time to become professional figure painter, with his business Volley Fire Painting Service. In addition to painting legions of figures, he has worked with many manufacturers across the industry and examples of his work can be found in many rule books, magazines and websites. Andy is also a co-host on the podcast ‘A Few Brits and the Hobby’.